Can you call chocolate healthy? 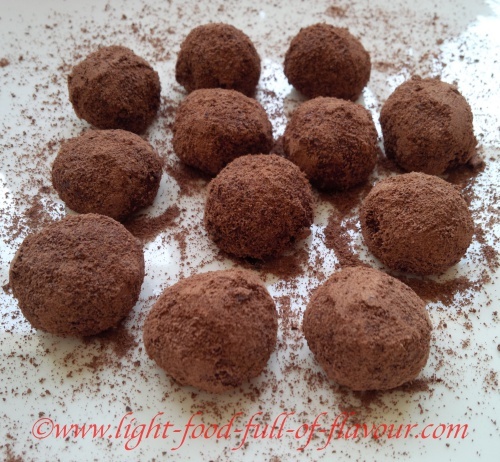 My raw chocolate truffles are rich in healthy ingredients and are also really easy to make. On top of that these chocolate truffles are gluten-free, dairy-free and suitable for vegans. I eat a lot of healthy food on a daily basis. I also eat a small amount of chocolate on a daily basis – minimum 70% dark chocolate though. And sometimes I use raw cacao nibs, or raw cacao powder – which I buy at health food shops – in things like my Quinoa Pop Muesli. Raw cacao nibs are broken up pieces from the cocoa bean, once the bean has been roasted and the husk has been removed. Raw cacao (nibs or powder) is rich in antioxidants, different minerals and fibre - but is also a stimulant as it contains theobromine, which can have a similar effect on your body to caffeine. I have combined raw cacao powder with coconut oil, walnuts and raw organic honey to make these raw chocolate truffles. Walnuts are apparently the healthiest of all nuts as they contain the highest level of antioxidants compared to other nuts. These nuts are also rich in several minerals, including calcium and magnesium which are both really important for the health of our bones. The honey I am using is a raw organic honey – a lovely orange blossom honey at the moment. It is still a type of sugar but a sugar that is full of minerals. Runny honey has been through a heating up process to “clean it up” and make it easy to use. This heating process removes all the goodness of a raw honey. Runny honey has more or less the same effect on your blood sugar as ordinary, refined sugar has. Once my raw chocolate truffles have firmed up, I dust them with raw cacao powder. 1. Add the walnut halves to a food processor and pulse for about 30 seconds. 2. Place the coconut oil in a pot over a low heat and stir until melted – it won’t take long. Remove the pot from the heat and stir in the honey, chocolate and the grated walnuts and mix well. 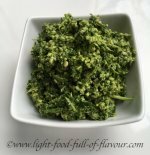 Place this mixture in a bowl and place the bowl in the fridge for about 15 minutes. 3. Remove the bowl from the fridge and form 12 truffles with your hands. Place the truffles on a plate and put this plate in the freezer for a further 15-20 minutes. Remove the truffles from the freezer and dust them with raw cacao powder. Store the truffles in an air-tight container in the fridge.